Our goal is not to teach you how to be the funniest person in the room, it’s to make the whole room funnier. ​All classes are 18 and up. Click here for schedule of current classes! 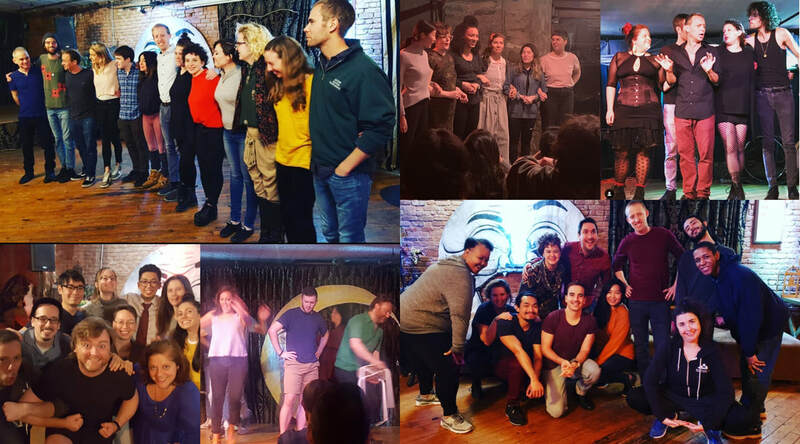 Our free Drop-In Classes are a fun and welcoming preview to what Brooklyn Improv Training (BIT) is all about. The Drop-Ins mirror elements of our Fundamentals 1 course, focusing on letting go of judgement, having Fun with a capitol F, and experiencing BIT’s ensemble approach to teaching improvisation. The 90 minuets will fly by! Stay for the afterhang to meet and mingle with fellow students and to chat with the instructors. No previous performance or improv experience necessary. Ages 18 and up. REGISTER FOR A DROP IN CLASS TODAY! This class, taught by LOM co-founders, Nolan Kennedy and Scarlet Maressa Rivera, is the next step in the process of creating spontaneous work as a cohesive ensemble. This 6-week intermediate Improv Course builds upon the ensemble improv techniques set forth in B.I.T. Training Level One. Areas of focus include: character work, status, medium and long form scenes, and much more, all while embracing the “strong and wrong." Level One Brooklyn Improv Training or related improv experience is required. REGISTER FOR IMPROV FUNDAMENTALS 2 TODAY! In this 8-week course, students will learn the mid-form and long-form structures used across the world of improv. This advanced course focuses on interweaving multiple story lines, exploring nuanced character development, and composing as an ensemble. Forms explored: Le Ronde, the Harold, Countdown, and more. The final class ends in an invited showing of what we have been working on! BIT Fundamentals 2 or equivalent training required. Sign up for BIT Improv Fundamentals 3 here! Looking for a fun way to incorporate Improv for corporate team building? Think quick on your feet and build creative decision making skills? Cancellation Policy: 75% refund before the first day of class. 50% refund before the second class. No refunds after you take the second class. Sorry, we cannot prorate any portion of the class.